Be Found Doing the Work of the Lord! Last week a friend and I worked out together at the gym. While we sat rowing away we shared our 2016 goals. I confided that I didn’t make my typical long list this year. I decided to just focus on the core. She asked what I meant…. I shared that this year instead of writing out a list of new goals, I just adopted a simple mantra… I want to be found doing the work of the Lord. Whether it’s lifting other’s spirits, forgiving more quickly, doing more serious scripture study or being more consistent about my temple attendance. The central or most important part of my daily living will be to focus on the core teachings of the prophets. To help me remember to consistently attend the temple, I created a temple attendance chart so I could have a visual reminder to help me get there every month. To help me remember to focus daily on the core, I’ve added planks and sit-ups whenever I exercise — my physical reminder to strengthening my core in 2016! I love sharing printables and hope that this one will help you strengthen your core as you do the work of the Lord. 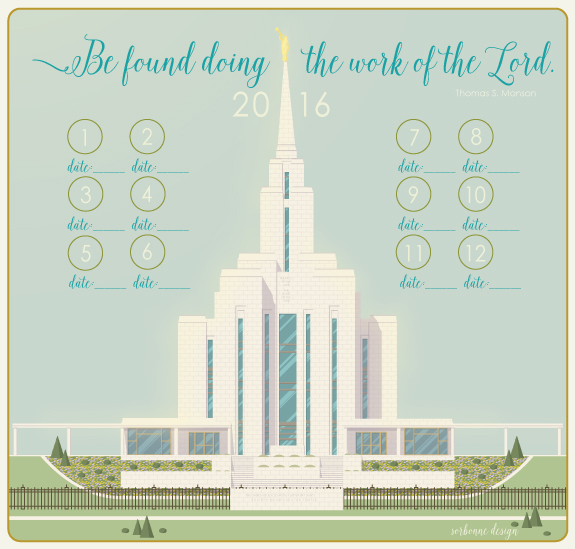 This entry was posted in Printables, Relief Society and tagged Free printables, Make the temple a priority, Temple Attendance Printable on January 20, 2016 by April Sorbonne.